In a bowl, mix the Greek yogurt with the rosemary, 1 tablespoon of olive oil, a pinch of the sea salt, and a pinch of black pepper. Season both sides of each chicken fillet with a pinch (what fits between your thumb and pointer fingertips) of Lawry’s and black pepper Sprinkle with lemon juice (to taste–you can always add more lemon juice while the chicken cooks). Add in the chicken fillets and cook until about 2/3 of the way done. Then move the chicken fillets to the grill/stovetop grill pan to finish cooking and to give the chicken the classic grill markings. (Cook until golden brown and there are dark [but not burned] grill marks). Now it’s time to build your burger. 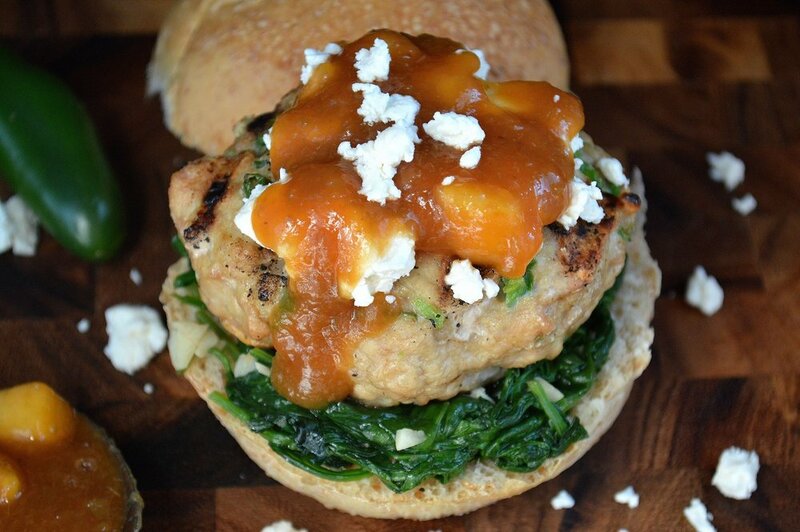 Spread the Greek yogurt aioli on a bun, top with the chicken, peach slices, and baby spinach. (You can also add a soft, white cheese if you’d like). Top with the other half of the bun and serve!